One thing I hear a lot of people advocate is to have a certain number of books as a reading goal – such as 30 books a year. I don’t think that’s a great way of looking at it – and instead I prefer to use time spent reading as a better metric than how many books I’ve completed. Some books are short; some are long. Some you can breeze through; some are best read slowly, pausing to think. Some are helpful cover-to-cover; some may have only sections that are beneficial. Time, therefore, is a better measurement of how well I’m reading and how much profit I’m deriving. And I believe that setting time goals is appropriate. I don’t set a plan of what books to read in what month. Instead, I try to schedule in a certain amount of reading and let the book completion take care of itself. In Lit! 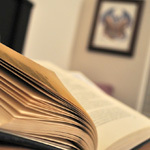 : A Christian Guide to Reading Books, Tony Reinke offers up some interesting calculations: If you read one book a week for the rest of your life, you will only have read approximately .01% of the available books out there (and that’s not counting all of the blog posts, ebooks, and magazines). In other words, for every one book you read, you’re deciding not to read 10,000. That’s the important decision: what not to read. I’ve been guilty in the past of putting any interesting-looking book on my reading list. And within months, I had a list of hundreds. I can’t read fast enough to keep up with everything that I want to read, so I have to be discerning in order to maximize my benefit from reading. This, at first, may be a frustrating fact – but it’s life. You won’t be able to read everything you want to, so you’ll have to make some tough decisions about what not to read. In order to decide what not to read, first sit down and think about your goals in reading. What are your priorities? What are you trying to accomplishment? 5. Reading to pursue vocational excellence. First, I treat my daily devotional reading as its own separate pursuit. My priority there is to fellowship with God, enjoy him, and center my mind on him. 1. To know, understand, apply, and reflect on Scripture. This includes Bible study but also reading theology, commentaries, etc. 2. To grow spiritually in specific areas. I read books on certain subjects where God is really prompting me and working on me. 3. To develop excellence in the area of biblically-based time management. This one will be unique to me, but I try to develop excellence in this area which I write about. 4. To rest and relax. No explanation needed here. Reading certain books helps me unwind. 5. To be an educated and interesting person. Perhaps some will think this priority is strange. I want to read to expand my understanding of the world around me, and I try to be an interesting conversationalist. 6. To develop practical skills as appropriate. Whether I’m doing home improvement, financial investment, or learning to lift weights with proper form, I read to assist in developing these skills. So now that we have these priorities, how does that influence how we choose books? I once thought of choosing a book for each priority and having an organized list of exactly what I was going to read and when. But the approach I now take isn’t very strict. I don’t worry about making sure that I spend exactly 20% of my time reading in this category and exactly 35% in that category. Instead, I just regularly evaluate whether my actual reading is in line with my goals. It’s a difficult thing to quantify because many of the books that I read fulfill multiple priorities. For me, the evaluation is more of a feeling – a gut check before I purchase books or spend time reading them. I don’t worry if my balance looks temporarily off. I may focus on a particular category for a few weeks, eventually balancing things out in the long run. With these priorities as your guide, be discerning about what books you choose to invest time in reading. Know before you start to really read the book what you want to get out of it. Spend some time evaluating a book before purchasing or reading. A little time invested up front can yield great dividends if you avoid reading less valuable books. I used to be the type that would want to read every word of a book. I wanted to give the author a fair shake, and I also wanted to follow the author’s intended path. Anything else felt like fast forwarding through a movie or skipping to the ending. But one of the worst wastes of your time and energy is to read something that isn’t helpful. Having these priorities helps you to choose what to read, but it also helps you determine why exactly you’re reading a book in the first place. Keep that purpose in mind and don’t be afraid to skip around or skim a book as appropriate. And don’t be afraid to stop reading altogether. Do you have a reading plan? What tips would you share?